Photo DVD Maker is free to try. There is no trial period and you can use it as long as you like. However, the trial version only allows you to add 36 photos and there will be a watermark in the output slideshow. After purchasing license code, you can register Photo DVD Maker and enjoy all the features without limitation. And version upgrade is free too. 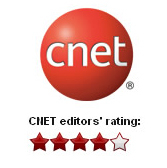 Photo DVD Maker was awarded with 4-star rating by CNET editor. "Photo DVD Maker is a wonderful program...Its simple operation and excellent results make this a program we highly recommend." Your programs are great. They have made a lot of people very happy. - Robert W. Ratterree Sr. I have been using this version with great satisfaction. Copyright © 2005-2019 Anvsoft Inc., All Rights Reserved.